I have clients looking for these planes, and can have cash at your hangar in 72 hours. I have buyers looking for wheel pants for a variety of aircraft. If you have a set of wheel fairings just gathering dust in your hanger, call me now. I have a buyer with a need for several Cessna 152s. And, I need some inexpensive Cessna 150s for student pilots. 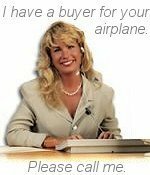 If you or your flight school is selling aircraft, call me now. We have an immediate buyer for a 180 HP Cardinal. If yours is for sale, please call me. I have a client with an immediate need for a Piper Warrior. Either low-time or run-out engine is OK. Call me, please. We need your DeHavilland Beaver now ! If you have this plane, or know where one is for sale, call me right away and earn a nice finder fee. We have a buyer for two Cherokee 180's and can be at your hangar in 48 hours. Please call me if you have a Cherokee 180 to sell. We have a client looking for a good Cessna 206. If you know of one that is for sale, but not currently being advertised on the Internet, please give me a call. We have several clients thinking about buying something they can land on water. Ready to sell yours? I pay a finder's fee if you help me find the right plane. If you know of one for sale, that's not listed on the internet, please call.